Joe will walk us through the entire process from raw blank to turned bowl to safety tips to prevent nicking fingers on the sharp, pointy wings. This looks to be a really fun demo. Come early to chat with your fellow turners and share you tales of turning experiences. We also welcome visitors and guests. No experience required to attend a meeting. If you haven’t paid your dues for 2018 yet, our treasurer, Dave McKeithan, will gladly accept your payment at the meeting. Paid members will have name tags available. Dues are $30/year for single memberships and $45/year for a family membership. As usual, we will hold a raffle for turning-related items. Tickets are $1.00 each or 6 for $5.00. 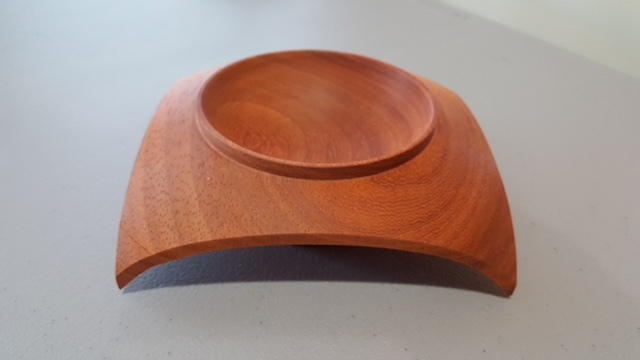 If you have any extra wood, spare turning tools or accessories you no longer need, or other woodworking items you would like to donate to the raffle, please bring them to the meeting. For each raffle item you donate (up to three) you will receive one free raffle ticket. What did you make this month? Whatever you made, bring it with you to the meeting to share during the show-n-tell portion of the evening. We’d really like to see your turning treasures and know about the fun time you had making them. The Town of Waxhaw is holding its annual Spring festival on May 19 and 20 in downtown Waxhaw (Main Street). We would like to participate but to do so we need several folks to help us load up the trailer, set up at the festival, man the lathes on Saturday and Sunday, pack up after the festival closes and unload the trailer back at our meeting place. We need at least four folks to do the pack up on Friday the 18th, three or four to set up on Saturday morning, eight folks to man the lathes during the weekend in two to four hour shifts and four folks to break down, pack up and unload on Sunday. If you can help, please let Kim, Bob, Dave or me know ASAP, so we can plan to get our application into the festival committee. Remember, this is one of the ways we gain new members so please take some time to join us at the festival and have fun turning tops for the kiddies and chatting with potential new members and turners. We’ll talk more about this at the meeting but don’t wait until then to let us know how you can help. 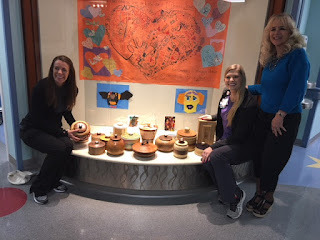 We delivered 18 Beads of Courage bowls to the Child Life Center at Novant/Hemby Children’s Hospital on March 21. The hospital staff were ecstatic. Here’s a photo of our President, Kim Bass with the staff and some of the bowls. Beads of Courage bowls delivered ! We could not have done this without your support and turned bowls. We send a big THANK YOU to everyone who participated in this effort. Let’s keep up the momentum and bring in more bowls. See you on the 3rd. * 13428 Providence Road, Weddington. If using a GPS, use Matthews as the city.